Mill Lane Studio: Bangles and Rings Galore - A fun session in the studio! Bangles and Rings Galore - A fun session in the studio! What a fun day in the studio yesterday! I was joined by one of my very enthusiastic past resin students who brought along a friend for a day in the studio casting bangles and rings. She just can't get enough of working with resin! 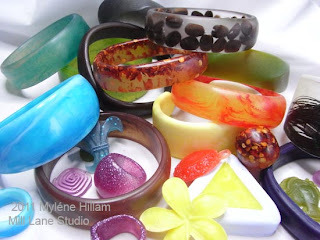 Their mission for the day was to create as many OOAK resin bangles and rings as they could. And they came prepared..... moulds, resin, objects to embed.... these girls were on a mission, and they knew exactly what they wanted to achieve. Here's just a small sampling of what we created during their session. We embedded feathers, coffee beans and chilies. We also marbled, swirled and coloured. And we glittered and sprinkled too. By the end of our marathon we had cast more than 35 bangles, rings and jewellery pieces between us! So if you've done one of my Bangle and Ring workshops before and you'd like to get really productive like these two ladies, why not join me in one of my personalised studio for hire sessions where you have access to an extensive selection of moulds, all the guidance you need and a perfect space for creating. With Christmas fast approaching, this might be the perfect solution for all the girls on your gift giving list. Imagine all the fabulous handcrafted bangles and rings you could make for them! I provide the moulds and the guidance, and you provide the creativity. I promise you a fun and productive day! For further information, contact me via my website, Mill Lane Studio. How cool! That looks like so much fun! We do have a blast in these sessions Jennifer! Everyone has their creativity firing and there are ideas flying everywhere... it's a lot of fun!